The baptism of an infant or young child (up to the age of seven years old) is celebrated according to the Church’s Rite of Infant Baptism with parishioners of St. Cyril Parish. The celebration is offered monthly (except during Lent). The sacrament is celebrated in English on a designated Sunday at 3:00 PM or in Spanish on a designated Saturday at 12:00 PM. Periodically during the Liturgical Year, baptisms may be celebrated at a Sunday Mass. Prior to the celebration, parents are required to attend a Baptism Preparation Series which is offered four times each year. Please call the Parish Office (520-795-1633) for more information and to make arrangements for a required pre-session interview. The baptism of adults, children of Catechetical age (seven years or older) and teens is celebrated using the Church’s Rite of Christian Initiation of Adults. This is an extended formation process consisting of various catechetical periods and liturgical celebrations leading to a celebration of the three Sacraments of Initiation (Baptism, Confirmation and Eucharist) at an Easter Vigil. For more information, please call the Parish Office (520-795-1633). It is the policy of the Diocese of Tucson that with Catholics who were baptized in infancy or early childhood, Confirmation is celebrated when they are at least fifteen years of age. An exception to this is allowed for eighth grade students who have been in a Catholic elementary school for at least one year prior to the year of Confirmation. Preparation of those eligible to celebrate the sacrament begins with the start of the school year. 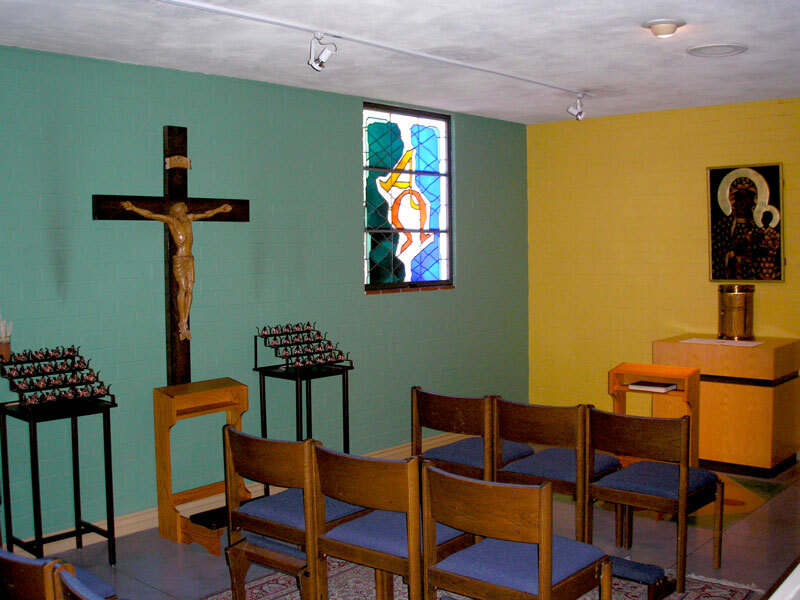 For Catholic adults, who have celebrated their First Communion and only need Confirmation, a separate preparation program is offered each year in the parish. Please call the Parish Office (520-795-1633) for more information. For baptized Catholic children who are at least seven years of age, a formation program for First Communion is offered each year in preparation for the celebration of First Communion on the Third Sunday of Easter each Spring. Prior to participating in this program, students must have participated in the preparation for and celebration of First Penance (see below). For more information, please call Luís Gonzalez (Director of Religious Education — 795-1633, Ext. 104). Catholic adults, who have only celebrated Baptism and need to celebrate their First Communion as well as Confirmation, participate in the parish’s Rite of Christian Initiation of Adults process (see above under Baptism). Please call the Parish Office (520-795-1633) for more information. This sacrament is intended for persons who are at least of Catechetical age (7 years) and are preparing for surgery, or are afflicted with a serious, (though temporary) or chronic illness (be it physical or mental), or are elderly. It may be celebrated individually by making an appointment with a priest of the parish. If possible, other family members and/or friends should accompany the person during the celebration. The celebration may occur at the parish, at the person’s home, in the hospital or nursing care facility. Please contact one of the priests of the parish or call the Parish Office to make an appointment (795-1633). Periodically during the year, the sacrament may be celebrated in a communal liturgical rite in the church either during a Sunday Mass or at another time. When it is clear that the person is dying, the Church celebrates The Last Rites and not an Anointing of the Sick. The Last Rites are prayers of commendation (commending the person to the Lord’s eternal care) and Viaticum (communion as “food for the journey”) if it is possible for the person to receive communion. Please contact one of the priests of the parish or call the Parish Office (795-1633) to make arrangements for celebrating these rites. The sacrament of Penance is celebrated with Individual Confession each Saturday from 3:30 – 4:30 PM in the church. It may be celebrated at any time by appointment with a priest (call the Parish Office to make an appointment – 795-1633). The sacrament is celebrated during a communal celebration of a Liturgy of the Word with Individual Confession during Advent and Lent. Posting of the date and time will be in the parish bulletin at the start of each of these Liturgical Seasons. First Penance is celebrated each fall. A formation program to prepare for this celebration is a part of the Parish’s Religious Education Program. For more information contact Luís Gonzalez (Director of Religious Education – 795-1633, Ext. 102). Weddings are celebrated throughout the year, except during Advent (the 4 weeks prior to Christmas) and Lent (the 6 weeks prior to Easter). In accord with Church Law, at least one of the parties to be married must be a member of St. Cyril Parish, otherwise special permissions are needed. Marriage Preparation is to begin at least 6 months prior to the wedding. It is strongly recommended that a couple planning to be married at St. Cyril Parish contact the parish (795-1633) before making any contractual arrangements with a facility for their reception. During the initial interview with a priest of the parish, the couple will be provided with all the necessary information needed for their preparation experience. For both men and women, there is an online resource concerning the various Religious Orders and Communities of men and women: VocationMatch.com(EncuentroCatolica.org). This site allows seekers to match their personal profiles against the profiles of hundreds of participating Religious Orders and Communities.